The first concern with any move is always boxes. Where are you going to get all the boxes you need to pack up everything you own? 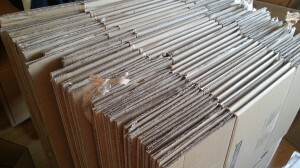 A simple approach is to buy the boxes you need from a moving store. Although efficient, that can be a very expensive proposition. A viable option would be to go to nearby grocery and liquor stores. They will have an endless supply of boxes. You might even be able to find free boxes on Craigslist from all folks who have just completed their own move. Once the boxes are secure, you can begin packing. Ideally, you should try to pack a little each day leading up to the big move day. The more you can get done before that big move day, the better off you will be. One thing you should be aware of when packing is all the junk you’ve collected over the years. There could be a lot of things in your closets, cabinets and drawers that you’ll never use again. Why would you bring that to your new home? Why waste a box on stuff you might end up throwing out? This is where hiring Junk King Dayton comes into play. A few days before your move, you can schedule a junk removal session with Junk King Dayton. They’ll send over a team of movers and a truck big enough to hold whatever you want to get rid of. It might not just be unwanted clutter from cabinets. You might decide you don’t need that old futon. You could be replacing your bedroom set or swapping out a sofa. All of those big items should definitely be kept off the moving truck. Imagine being force to make a second trip on moving day because you’re moving furniture that you’re not even going to keep. That is not a smart move! Instead, Junk King Dayton can take it all away in a single session. Everything that you turn over to Junk King Dayton also will have the opportunity for a new lease on life. That’s because Junk King would much rather donate than dump. Junk King Dayton can make sure you don’t move old junk into your new home. This entry was posted in Dayton Junk Hauling and tagged Junk King, Junk removal, new home on October 31, 2017 by Junk King. Last updated October 31, 2017 .